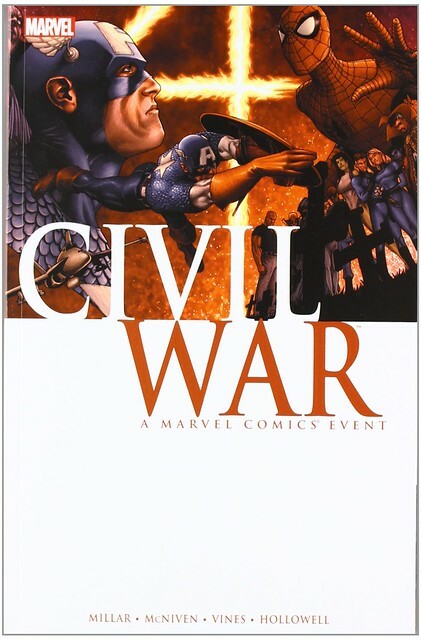 After all these years, I have finally gotten a chance to read the famous Civil War arc. Due to the movie recently coming out, it makes sense that a lot of copies from the comic would be lying around. It certainly holds up as one of Marvel’s greatest events although you do lose a bit of the narrative by not reading any of the tie ins. I still say that big Marvel/DC events should be a little longer (10+ issues) but a lot still happens here and it is quite epic. This was back during Marvel’s prime and everyone is solidly in character although the ending is pretty iffy. A few teenage heroes fail to stop a villain named Nitro and a school full of kids is blown up. Iron Man decides that heroes should no longer run rampant and agrees with SHIELD and the Government on the Registration Act. Heroes have to formally register and give out their secret identities if they want to continue operating. Moreover, the government will be making many more decisions when it comes to crime fighting. Captain America disagrees with this law and evades arrest by SHIELD. He gains some more sympathizers and the Civil War is now on! Captain America’s side is definitely portrayed as the right one in this battle. The registration quickly starts to become rather extreme and SHIELD cannot be trusted. Iron Man’s side also begins to hire murdering villains as allies to round up the heroes. They even build a very morally iffy jail in the Negative Zone to contain the heroes and clone Thor. The tie ins typically chose sides as well so sometimes Captain America’s group would come across as a little iffy as well, but through it all they were the “heroes” this time. The art is excellent and easily one of Marvel’s more impressive creations. The fight scenes are handled very well and do a good job of having a serious vibe to them while still feeling like comic book fights. It’s definitely fun to see all of the heroes on panel at once and the event does feel like a big crossover epic. I do miss some of these classic costumes like Cyclops, Captain America, and Spider-Man’s. Before the gimmicks, there were the original costumes and those are the ones that are present in Civil War. Before going any further into the comic analysis, I can safely say that I am on Team Captain America as well. For starters, SHIELD can never be trusted. There are always Hydra agents in their ranks and as soon as this sensitive data is put on a database it will be hacked. Sharing their secret identities is very risky for the heroes families and friends. I know that Spider-Man discussed the situation with Mary Jane and Aunt May first, but it was definitely not a good decision on his part. He rectified this later on, but he has dozens of enemies and most of them would definitely wreck his life in the blink of an eye. Especially the local ones like Hammerhead and Kingpin who could easily make a move. If there was a way to make the whole process absolutely safe, then I would probably agree with Team Iron Man. Unfortunately, there isn’t and there never will be. That’s simply the nature of comic books. Also, if you really think about it, this won’t stop a similar incident from occurring. Sure, the teen heroes wouldn’t be able to have a public livestream, but they could always do it in the sneak. Not to mention that there will always be heroes who won’t register. The only difference from now is that more heroes will be hunted like the mutants are. I’m sure the heroes wish that they could be in DC land where the heroes typically aren’t attacked quite as often. At the very least, the government seems to tolerate them. Captain America’s a great leader as you would expect. He shows off his military tactics and does a good job of pressing the advantage on Iron Man’s team. His plan for Hulkling was also well done. As mentioned earlier, I did not agree with his final move though. Sure, there was a lot of property damage, but he basically deserted everyone who had been following him. He just left them to dry. People are going to get injured regardless and the heroes did try to evacuate the area. The humans probably just hid and decided to attack voluntarily. Just because the civilians are on Team Iron Man doesn’t mean that it is the right side. Cap ends up getting shot in a story shortly after this one so he may want to rethink the whole thing. I do agree with his move to have Punisher leave the team though since he is a murderer. That being said, this is one of the cooler appearances from the Punisher. He took down 4 villains with ease and he played a big role in infiltrating the tower for the plans. He simply follows a more lethal methodology than Cap and isn’t going to change anytime soon. He doesn’t aim to be a hero, he just wants to destroy as many villains as possible. It’s what makes him fall to their level, but he is certainly a lot more likable than the average villain. Refusing to fight Cap was also an intense move that took character. Iron Man is naturally not all that likable in this one. He does really try to bring Cap on his side, but there’s no way that it was going to work. Not to mention that Iron Man really tries to take charge immediately and that really defeats the chances of having a big debate about the whole thing. He comes across as rather trigger happy when Spider-Man decides to leave as well so the fight was really unavoidable. Iron Man definitely got lucky there too since he’s not quite ready to deal with Spider-Man just yet. If you were getting sympathetic to his side then no worries, SHIELD quickly steps in again and tries to destroy Spider-Man. They don’t really take prisoners at all and show a general disregard for the heroes. Building the Thor clone was another big strike against his side. Iron Man’s not completely unreasonable though so don’t think that he is a downright bad character. He does a decent job of championing his side, but I feel like his mind is changed way too easily. All it takes is one lady spitting at him for Stark to take the whole thing seriously. I think he should be able to stay true to himself a little more strongly than that. Mr. Fantastic was fairly cool. I do consider him to be one of the more underrated Marvel characters at the moment, but he’ll change that soon enough. He can be a little inconsistent though. Despite the fact that Invisible Woman is on the other side, he does make sure that the government won’t arrest her regardless of the outcome. That’s the kind of move that I would hope to see from some of the others make, but they typically don’t have the guts. Spider-Man looks great in this trade. This was back when people took him seriously and he’s treated like an adult hero who commands respect. He’s seen as no different from Cap, Iron Man, and the other big heroes which is as it should be. He can hold his own in a fight and certainly goes through the wringer. During the story arc he takes on about 5 fighters at once and defeats them all. He also seems to have had the edge against Cap and Iron Man as well. I was really glad to see him lose the Iron Spider armor though. It’s fine for once in a while, but I definitely prefer his traditional look. His portrayal was spot on. He made a mistake, but doesn’t hesitate to fix it. I can’t take Namor seriously and still don’t like the guy. I don’t believe that his forces were the game changer that they were made out to be. By and large, Cap’s team was seriously outgunned though. Even by the end when the numbers were almost equal, the fighting forces were not. Iron Man’s team has the Sentry on it. Isn’t that basically game over since Thor and Hulk aren’t in the equation? Ms. Marvel is strong as well, but as far as I know she was on Tony’s side as well. If not, she could at least give Sentry a decent fight. Cap’s team was starting to have the upper hand by the end though and I won’t call plot hax on that considering just how many heroes were involved. There may have been some big shots that I am unaware of. Maria Hill gets a pretty humiliating ending as Civil War comes to a close. She was particularly unreasonable throughout the arc so it makes sense that Iron Man should get the last laugh here. SHIELD is one of the main reasons why I couldn’t be on Iron Man’s side so it was good to see her demoted. It also looked good on Iron Man’s part since he had to notice that she was really jeopardizing the team’s chances at winning over the crowds. With her out of the way, Iron Man should be able to start making a positive difference. He may have been on the wrong side, but he can still make the best out of the situation. There were certainly a lot of other characters involved in the story and I can safely say that they all looked rather good. I’m a little disappointed that the X-Men didn’t get involved, but it makes sense why they could not. They would join Cap’s side and then it would barely be a fight by that point since Iron Man’s side wouldn’t stand a chance. Just Cyclops and Emma Frost are intimidating enough, but the X-Men had legions of members at the time. Even if Iron Man’s side brought in every villain from the jail cells and threw in the Sentinels they wouldn’t be guaranteed of victory. They would guarantee themselves a bad rep and a lot of civilian casualties though. Overall, Civil War was definitely a game changer for Marvel. Marvel always likes to say that each event is the biggest one yet and that it will change things. Sometimes that’s true and sometimes it isn’t, but Civil War was definitely a title that turned the tides. It made things rather rough for the heroes for quite some time. After all, the ending to this comic is pretty somber and it does start to lead into Dark Reign and Siege. Ultimately, Iron Man basically agrees that the Civil War was a bad idea. The sequel just started so it will be interesting to see how that one is. I actually think it should be fairly great, but I don’t see it possibly matching up to this one. This one was just a blast and I highly recommend it to all Marvel fans. It’s a very engaging story with fast pacing that never lets up. It’s the big character crossover that fans have always wanted much like the Secret Wars and Infinity Gauntlet arcs. The only difference was that this time it was heroes against heroes. This entry was posted in Comic Reviews, Comics, Reviews and tagged Black Panther, Captain America, Civil War, Comic, Comic Review, Fantastic Four, Iron Man, Marvel, Marvel comics, Review, Spider Man, X Men by dreager1. Bookmark the permalink. I been wanting to read this book. I like the movie Civil War and I heard that the comics were a little bit different. If Fox and Disney got a long with the superheroes, I bet the movie will be different. Imagine the Fantastic Four and X-Men were in the movie. The film was a bit of a loose adaption, but I agree that it would have been closer if they could have used those other characters. They did a great job with the characters that they had. I highly recommend checking out the comic, it’s definitely quite amazing and everyone gets a good role to play. Yeah MCU did great either way with the characters they had. If it did happen though, it would be the biggest budget movie ever XD. Have you read the other Civil War comics like X-Men, or Frontlines? Sadly not. Frontlines was the X-Men tie in? Or is that a similar event with a Civil War sort of like Schism? I haven’t read any of the Civil War tie ins yet aside from a brief story involving Spider Woman a very long time ago. I definitely look forward to checking them out someday though. I just saw covers of Civil War Frontlines. I heard it was about people trying to get info on the war. There are many Civil War comics like Civil War Spider-Man, Captain America, and others. I think they did this to expand the Civil War story. Personally on the topic of Spider-Man, I thought it was bad idea for Spider-Man to choose Iron Man. He just revealed his identity to the world and now the villains will get him and his family and friends. It was a huge mistake on Spidey’s part. He did realize this and left by the end, but I do agree that him choosing that side in the first place was a little iffy. It really goes against everything that he has ever worked for. Just googled Civil War Frontlines and it definitely seems cool. Expanding the Civil War sounds good to me! Even though Spider-Man is my favorite hero, I wouldn’t side with him on Iron Man’s side. Glad that he changed later to Captain America. I agree what you said, his actions were against everything he said about keeping his secrets. I haven’t read the books but I heard that fans felt that the other Civil War comics help expand on each the character’s positions as oppose to just focusing on the war. I am assuming if you read the Spider-Man Civil War, it talks about his reactions towards the war and what leads him to Iron Man. Those definitely sound like good reads then. I’d certainly like to see more of Spider Man’s rationale before making the choice and even one for the X-Men to see them decide why they didn’t end up weighing in on the debate. Same here. I want more of what’s going with him. Same with X-Men. I wonder where are they at in this war. The only tie-in story I read to this is Young Avengers and Runaways since I was rrally into the Young Avengers at the time. Otherwise I’ve only read the main story but it was a ireally good story even without the tie-ins. Definitely, it holds up really well even without any extras. That being said, I’m hoping that they make a super complete version that brings all of the tie ins similar to what the Infinity Gauntlet did a while back. I’m hoping that Civil War 2 will also be excellent. Did the Infinity Gauntlet graphic novel hold ALL the tie-ins? Yes, but only the super version. It had over 1200 pages and brought along every prequel, tie in, and epilogue story. It was amazing! I can’t think of a better comic book event. Infinity Gauntlet, Forever Evil, and Maximum Carnage are the primary contenders for me, but I think Civil War might be the best. Good to see you finally checking it out Reager. I still need to check out Forever Evil and Maximum Carnage, but I can definitely say that IF is a contender. I’d probably call that one the greatest comic event of all time personally. 2nd would be this one, third Secret Wars. However, I think AvX in theory has a chance to crack the top 3 as well. It’s a shame that even though I’m a huge DC fan, I haven’t really read any of their events yet. Seems like a fantastic read, and i watched the movie. Really like it ! Awesome, glad you liked it! Things are definitely getting very exciting in the Marvel Universe now. Looking forward to the Infinity War. Superman’s should be good too. 2018 for part 1 correct? 2017 actually so we’re getting really close! I think that one could end up being even better than Infinity War since Man of Steel and Batman V Superman were so good. You thought the batman v superman was good? I’d give it a solid 7.5/10. But better than Man of Steel. Yes, my second favorite live action comic book film of all time! I gave it a solid 9/10, but granted I know that it is pretty surprising. The film didn’t exactly get the greatest of reviews. I think it just helped that I’m a super huge Batman and Superman fan so even just seeing them talk for over an hour was pretty fun.